Researchers: Adrian Antal Borsa, Duncan Carr Agnew, Scripps Institution of Oceanography, University of California, San Diego. Daniel R. Cayan, Scripps Institution of Oceanography and United States Geological Survey, Water Resources Division, La Jolla, CA. The Plate Boundary Observatory in the western United States consists of more than 1,100 continuously operating GPS stations deployed to record the Earth’s surface response to tectonics. Now the network is being used as a hydrological monitor. This study shows that the western U.S. lost about 240 gigatons of water in 2013-2014. 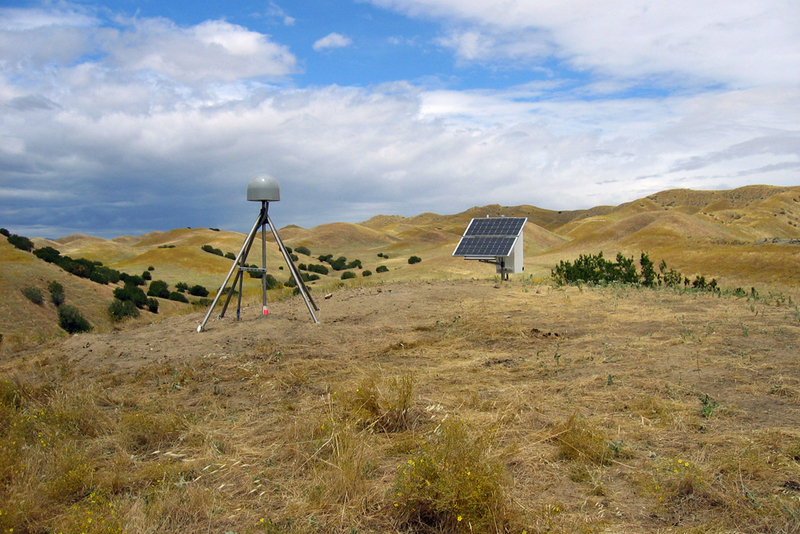 The observatory is a sensitive hydrological monitor that can help manage water resources. The solid Earth deforms elastically in response to forces such as earthquakes and the movement of magma, but also to loading and unloading from changes in groundwater, surface water, soil moisture, snow, and ice. When the water load decreases due to a lack of precipitation or excessive pumping from underground aquifers, Earth's surface will rise. Vertical motions at 772 GPS sites in the western U.S. were analyzed to calculate the changing water load over an 11-year period. The large seasonal signal from water loading was removed from the data in order to highlight the longer term trend, and the results were compared to precipitation and streamflow data in the region. The GPS data shows that in the drought-ridden timeframe starting in 2013 and continuing into 2014, about 240 gigatons of water load has been lost because of a lack of precipitation. The pattern of water loss is similar to the pattern of decreased rainfall and reduced flow in rivers and streams. This loss is equivalent to a 10-centimeter thick layer of water over the analyzed area, or the annual amount of ice loss in Greenland. The GPS results provide greater spatial resolution than the Gravity Recovery and Climate Experiment (GRACE) satellite mission and thus provide enhanced information about water distribution for water resource management on a local to regional scale.